The Administration and Congress have felt compelled to do something about the "financial meltdown," so an inefficient and inequitable "bailout plan" has been rushed through the legislature despite harsh criticism from the right and left. That's unfortunate. Both presidential candidates were stalling by qualifying the plan. Whichever candidate had had the courage to reject outright this proposal would have had the better claim to be President. Do not be fooled. The $700 billion (ultimately $1 trillion or more) bailout is not predominantly for mortgages and homeowners. Instead, the bailout is for mortgage-backed securities. In fact, some versions of these instruments are imaginary derivatives. These claims overlap on the same types of mortgages. Many financial institutions wrote claims over the same mortgages, and these are the majority of claims that have "gone bad." At this point, such claims have no bearing on the mortgage or housing crisis; they have bearing only on the holders of these securities themselves. These are ridiculously risky claims with little value for society. It is as if many financial institutions sold "earthquake insurance" on the same house: when the quake hits, all these claims become close to worthless  but the claims are simply bets disconnected from reality. Follow the money. Average Joes and Janes are not the holders of the other side of complicated, over-the-counter derivatives contracts. Rather, hedge funds are the main holders. The bailout will involve a transfer of wealth  from the American people to financial institutions engaging in reckless speculation  that will be the greatest in history. 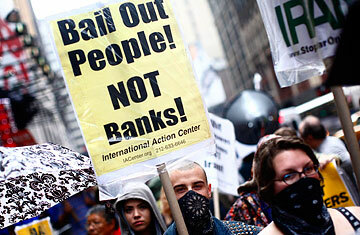 Rescuing financial institutions is not the best solution. Yes, banks are needed to provide capital to businesses. But it is not necessary to spend $1 trillion to maintain liquidity. If the government is to intervene, it should pick and choose which claims to purchase; claims that are directly tied to mortgages would be a good start. Let financial institutions fail, merge or be bought out. The faltering institutions will see their shares devalued and will be likely to be taken over by stronger institutions  as has already started happening. This consolidation of the financial sector is both efficient and inevitable; government action can only delay the adjustment. The government should not intervene. It should leave overleveraged financial institutions to default on their derivatives obligations and, if necessary, file for bankruptcy. Much of the crisis has arisen from miscalculating the risks involved in a large book of positions in these derivatives. It is only logical that these institutions pay for their poor management. Rather than bailing out Wall Street, we propose that the government should buy up the actual mortgages in question and do nothing else. The government should not touch any derivatives; that is, claims that do not directly tie into the actual mortgages. If money becomes too tight, then the Fed can certainly increase its loans to financial institutions. Let the poorly managed, overly risk-taking financial institutions fail! Always remember that Wall Street and the real economy are not the same thing.  Ari J. Officer has completed his master of science degree in financial mathematics at Stanford University. Lawrence H. Officer is a professor of economics at the University of Illinois at Chicago.